Stay while handler moves equipment. Dog must demonstrate a stay in any position (mat/platform optional) while handler moves equipment to set up the distance targeting/jump exercise. Purpose: Demonstrate stationary control in the presence of moving distractions. Equipment: Props the handler will need for the next exercise (jump, target and cone). 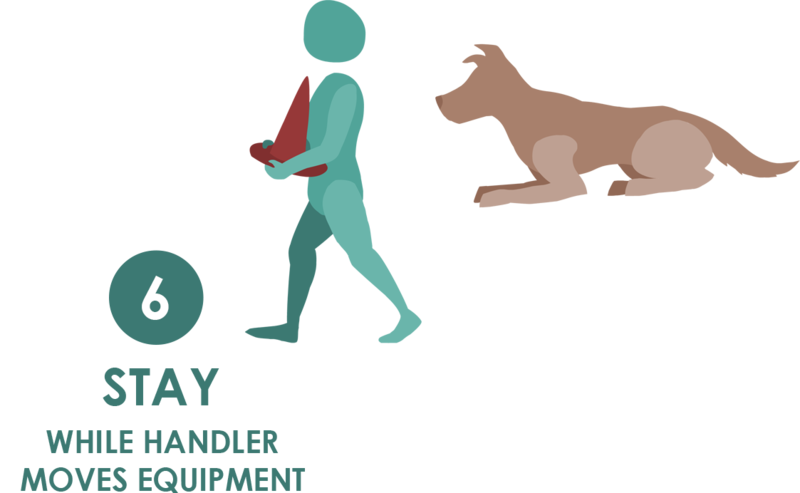 Exercise set-up: Dog is placed in any stay position of the handler’s choosing (down/stay, sit/stay, stand/stay, etc. ), with or without a mat or platform. The handler will then arrange the working area for exercise 3-7: Jump with Target and Cone. This may include moving cones, jumps and platforms into their proper locations. The minimum duration of the stay must be 20 seconds. If the handler completes the setup area in less time, then he/she must wait the full 20 seconds before releasing the dog. Once the next exercise is ready and 20 seconds have elapsed, the dog may be released, which ends the exercise. The handler may either return to the dog or release from a distance, and then must proceed directly into the next exercise. Non-qualifers: The dog does not maintain the stay until released. The length of the stay is less than 20 seconds. Video does not permit the exercise to be adequately judged.